- Clarkson Cup, held this past weekend, 'partnership' dollars were questioned. Committee members asked where the money for this came from, how much was given, and why they were not advised. it appears that some councillors were unaware of this amount of funding. - A councillor stated that there is a 'back-door'way to get funding/additional funding. Apparently, a letter to the mayor is all that is required for table sponsorship. - Councillors were unaware of how many requests are made or funds provided for a variety of special interest groups. Staff is to report back on the dollars given to these groups. - Council voted to keep the 2013 recommendation report, as there were not enough funds available for the increases that were requested. 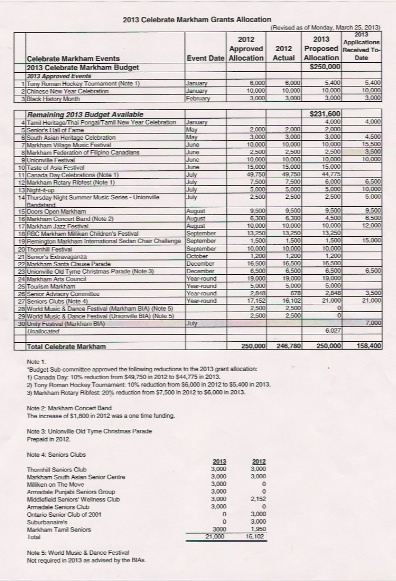 - 2013 Grants Allocation Budget was approved pending final vote at the next Council meeting.